Note: Winner of the Del Mar Futurity and the Breeders' Cup Juvenile last year. 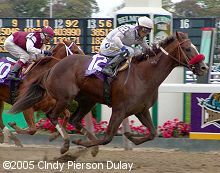 Was the heavy favorite in the San Rafael, but couldn't catch Brother Derek when he made his rally and finished 2nd by 1 1/2 lengths. Suffered a condylar fracture in his right front leg in a workout and will miss the Triple Crown.